Experience birth in the safety, comfort and privacy of your own home with no unnecessary interventions. Studies have repeatedly shown that homebirth for low-risk mothers with an experienced practitioner results in better outcomes for mother and baby. 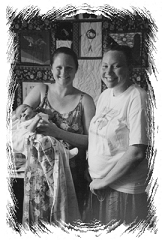 A licensed midwife can create a secure and reassuring atmosphere for a peaceful birth setting. The advisability of homebirth is discussed with the parents and considered on a case-by-case basis, in conjunction with other appropriate health care providers. Clinical care is provided by Nicole Lavallee, LM, CPM in accordance with SC DHEC regulations. Regarding her philosophy, Nicole says, "The foundation of my practice is parental education and informed consent. Whereas most hospital-based practitioners dictate their patients' care, I feel there are too many important decisions to be made in which there are no clear 'best choices.' Many tests, procedures and interventions fall under this category. It is important to me that expectant parents are full participants in decisions regarding their care. "My goal is to build a bond of mutual trust and respect prior to the onset of labor. The only things I expect of all my clients are good nutrition, conscientious exercise, continued education, that they will breastfeed and that they recognize my need to comply with SC laws and regulations in my practice of midwifery." For more information about homebirth, visit some of the links found here.